Over the years, Pew Research Center has tracked how the world views America, whether the measure was confidence in the U.S. president, the American government’s respect for personal freedoms or the overall favorability of the U.S. In this year’s poll of 10 European countries, four Asia-Pacific nations and Canada, views of the U.S. and its president were mainly positive, continuing the trend of the past seven years. But when we asked people abroad how they saw Americans given a list of characteristics, the answers were more of a mixed bag. 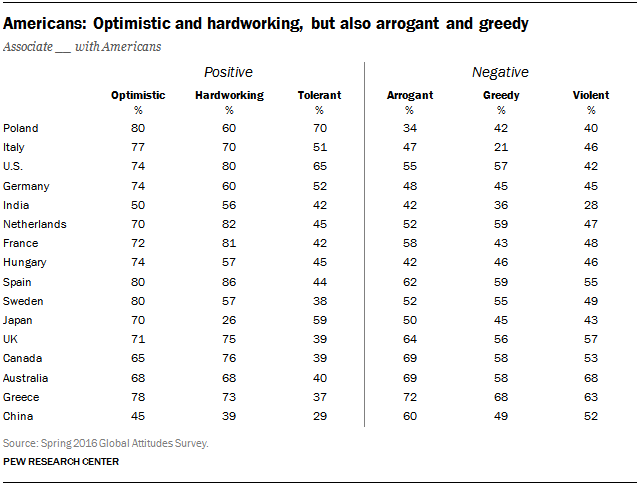 Half or more in 15 of 16 nations (including the U.S.) described Americans as optimistic, and majorities in 14 countries said Americans are hardworking, according to the survey which asked about three traits considered to be positive and three that were negative. But in only five of 16 countries did half or more of those surveyed credit Americans with the positive trait of tolerance – and one of those countries was the U.S. Half or more in 11 countries thought Americans are arrogant and many said they are greedy. While fewer people associated “violent” with Americans, there are still some countries in which more than half of people said that was the case. To look at these results more systematically, we created an index that combines responses from these characteristics. The index ranges from 0 to 6, where 0 is the most negative view of Americans and 6 is the most positive view of Americans. Those with more positive views of Americans are scored as 4 or above and those with more negative views of Americans are scored as 2 or below (3 is considered neutral). We then took the percentage of people above or below 3 in each country to create a scale of perceptions of the American people. Using this technique, we found that views of Americans are generally positive in most of the 16 nations surveyed. This includes majorities with positive views of Americans in Poland (61%) and Italy (59%). Indeed, pluralities in 10 of the 16 countries surveyed have overall positive views of Americans. The most negative views in the survey come from the Chinese (51% have more negative views of Americans). But it should be noted that over four-in-ten among people in Greece, Australia and Canada also share negative impressions of U.S. citizens. And even in the U.S., a quarter of Americans express negative views of their own people. It should also be mentioned that this particular survey was conducted in many nations where America’s image has been relatively positive in recent years, so it does not speak to attitudes of people in regions where anti-Americanism has been more common, such as the Middle East.